These tasty chicken burrito bowls are easy to pack and make the perfect hearty lunch for teens, kids and adults! In a slow cooker, place chicken and salsa. Cook on high for 4 hours or 6 hours on low. Prior to serving, shred between two forks. In a large skillet, heat oil over medium-high heat. Add the riced cauliflower and sauté, for about 5 minutes until the cauliflower rice is heated through and tender. Add in cilantro, stir to combine, turn off heat. 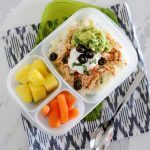 Assemble bowls by making a base of cauliflower rice, topping it with shredded salsa chicken, cheese, guacamole, black olives, sour cream, and additional cilantro.